Lakeland recently had a sale on their bakeware and after what feels like years of lusting after their mini sandwich tin I could finally justify the purchase with 40% off its usual price. As my workmate was leaving last week I had to christen the tins with her favourite coffee and walnut cake! As it was the first time using the new tin, I stuck religiously to the recipe on the Lakeland website as I wasn’t sure of the correct quantities to perfectly fill the tins. Preheat the oven to 180°C or gas mark 4 and thoroughly grease the mini sandwich tin. In a stand mixer, cream the butter and both sugars together until the mixture is pale and fluffy. Slowly add the beaten eggs, mixing well between each addition. Dissolve the coffee in the boiling water and add to the mixture, mixing to combine. Sift the flour and a pinch of salt into the bowl, add the chopped walnuts and fold in using a large metal spoon until the mixture is smooth. Divide the mixture between the mini sandwich tin (roughly 1 heaped dessertspoon of mixture in each well) and level with a teaspoon. Bake on the middle shelf of the preheated oven for about 12-15 minutes until golden, well risen and a cocktail stick inserted into the middle of the cakes comes out clean. Leave the cakes to rest in the tin for 2 minutes then ease out onto a wire cooling rack and leave until cold. To make the buttercream, cream the butter and icing sugar together until the mixture is pale and airy. Dissolve the coffee in the boiling water, add to the mixture and mix until thoroughly combined. Transfer half the icing to a piping bag fitted with a 1cm plain round nozzle. Cut the cakes in half and pipe a swirl from the outside in, on each bottom. Gently press the two halves together. Refill the piping bag and top the cakes with the remaining buttercream by creating a circle of short points of icing and a lower larger central blob. 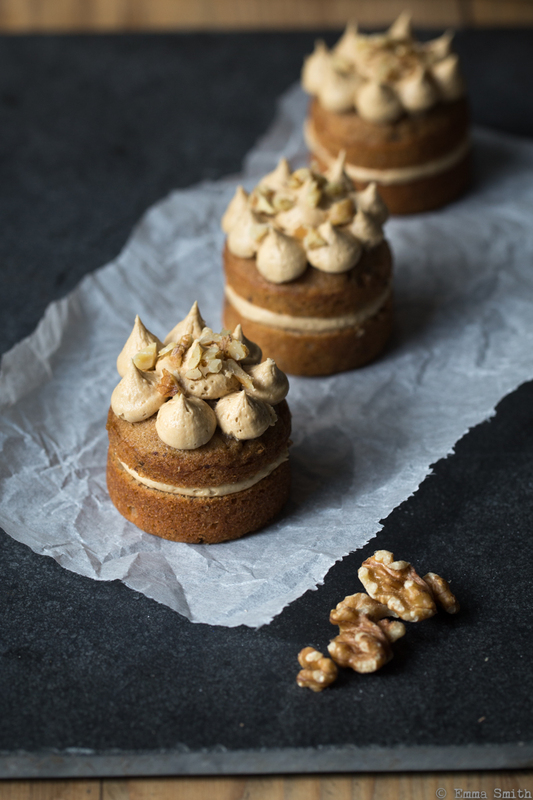 Top each cake with a walnut half or chopped walnuts to serve.